Ryan “Kingry” Garcia (13-0, 12 KOs), the 2017 consensus prospect of the year out of Victorville, Calif., will put his Junior NABF Super Featherweight Title on the line in his first headlining bout on the March 22 edition of Golden Boy Boxing on ESPN at Fantasy Springs Resort Casino in Indio, Calif. Garcia, a rising phenomenon of modern boxing, will also fight for the vacant NABA USA Super Featherweight Title as he faces the tough Mexican pugilist Fernando Vargas (32-15-3, 24 KOs) in this ten-round affair. ESPN and ESPN Deportes will air the fights beginning at 9:00 p.m. ET/6:00 p.m. PT, and stream live on ESPN3 starting at 7:30 p.m. ET/4:30 p.m. PT. Garcia has star potential written all over him. The 19-year-old won multiple national championships as an amateur before turning professional in 2016 at the age of 17. After several fights in Mexico and in the United States, Garcia signed with Golden Boy Promotions to finish off the year. 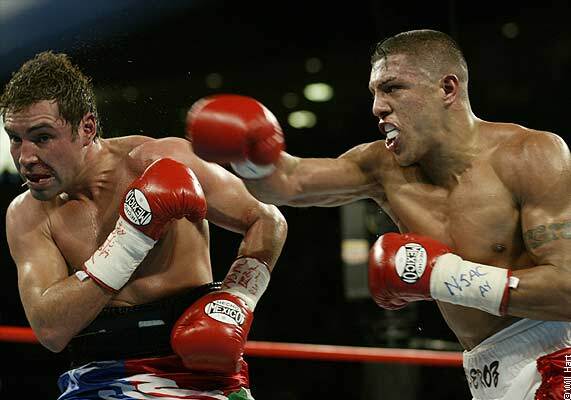 Since then, he has won every fight by knockout, including a highlight-reel knockout of Miguel Carrizoza to win the Junior NABF Super Featherweight Title on the Sept. 15 edition of Golden Boy Boxing on ESPN. Garcia is eager to defend his title for the second time in his headlining debut. Vargas is an aggressive brawler from Tijuana, Mexico. Vargas has fought the likes of Horacio “El Violento” Garcia, current world champion Jamie McDonnell, and has a victory against former world titlist Wilfredo Vasquez, Jr. The 29-year-old will look to derail Garcia’s rise with an upset victory. In the televised co-main event, two tough contenders will battle it out for a chance to rise in the 147-pound rankings. KeAndre “The Truth” Gibson (18-1-1, 7 KOs) St. Louis, Mo. will face Eddie “EBoy” Gomez (20-3, 11 KOs) of the Bronx, N.Y. in a 10-round fight. Both are coming off a tough challenge in a common opponent, Alejandro “El Elegido” Barrera on previous editions of Golden Boy Boxing on ESPN. Joet Gonzalez (18-0, 10 KOs), the Glendora, Calif. native who developed into a legitimate contender in 2017, will battle Rolando Magbanua (26-6, 18 KOs) of Cotabato, Phillipines in a scheduled 10-round fight in the 126-pound division. Gonzalez, who was a decorated amateur before turning professional, is coming of a third-round knockout victory against the experienced Isao Carranza, where he utterly destroyed the Mexico native. East Los Angeles, Calif.’s Jonathan “Thunder” Navarro (12-0, 6 KOs) will take on Cesar Valenzuela (7-2, 2 KOs) of Ciudad Juarez, Mexico in an eight-round 140-pound fight. Raul “El Cugar” Curiel (2-0, 1 KO), the welterweight prospect who participated in the 2016 Olympic Games representing Mexico, will return in the six-round swing fight against Quantavious Green (1-1, 1 KO) of Shreveport, La. Emilio Sanchez (16-0, 11 KOs) of Pacoima, Calif. will return in an eight-round super bantamweight fight against a soon-to-be-announced opponent in the first bout of the evening. Sanchez is an explosive puncher who is inching closer toward a regional title. Tickets for the event go on sale Friday, Feb. 16 at 10:00 a.m. PT and start at $25. Tickets will be available at the Fantasy Springs Resort Casino box office, by calling 1-800-827-2946, or by purchasing online at www.fantasyspringsresort.com. Media interested in attending Golden Boy Boxing: Garcia vs. Vargas must request credentials by emailing clavoie@fantasysprings.net by 5:00 p.m. PT on Friday, March 13. Garcia vs. Vargas is a 10-round fight for the Junior NABF and vacant NABA USA Super Featherweight Titles presented by Golden Boy Promotions. The event is sponsored by Tecate, “THE OFFICIAL BEER OF BOXING” and Hennessy, “Never Stop, Never Settle.” The fights will take place on Thursday, March 22, 2018 at Fantasy Springs Resort Casino. ESPN and ESPN Deportes will air the fights beginning at 9:00 p.m. ET/6:00 p.m. PT, and stream live on ESPN3 starting at 7:30 p.m. ET/4:30 p.m. PT.